‘Miss/Hit’ Published in FlashFlood – and Happy National Flash Fiction Day Everyone! My very short flash fiction ‘Miss/Hit’ has been published in FlashFlood as a part of National Flash Fiction Day, which is today! You can read my story by following this link here. There’s already a really nice comment on there about it! Thrilled! There’s so much going on today! There are free events in Bristol, as well as other places, and we also have The Write In where you’re required to write a piece of flash fiction from one of the prompts featured on the website. You can check out details of what’s happening today on the National Flash-Fiction Day website and blog. You can join The Write In if you’re up for the challenge! The link is here –> The Write In. Happy National Flash Fiction Day everyone! I’ll be heading to this event in Bristol tonight and I’m so excited! Landmarks: 2015 National Flash-Fiction Day – Out Now! Landmarks, the 2015 National Flash-Fiction Anthology (pictured below) is now available from Amazon in paperback by following this link. It will feature my flash fiction ‘Saharan Shades’. There are over 60 flash fictions in this anthology, which is based on the theme of Geography, and having volunteered behind-the-scenes to help put this anthology together I can tell you now that it is a great anthology of flash fiction. There are hugely talented flash fiction writers included in this collection and a vast array of stories. My flash, ‘Saharan Shades’, is a tale of fear, beauty, and thought captured during six thoughts in the Sahara desert. I won’t give away the rest! I’m looking forward to receiving my copy so I can read these brilliant stories on the page. Congratulations to everyone who has been published in this year’s anthology! 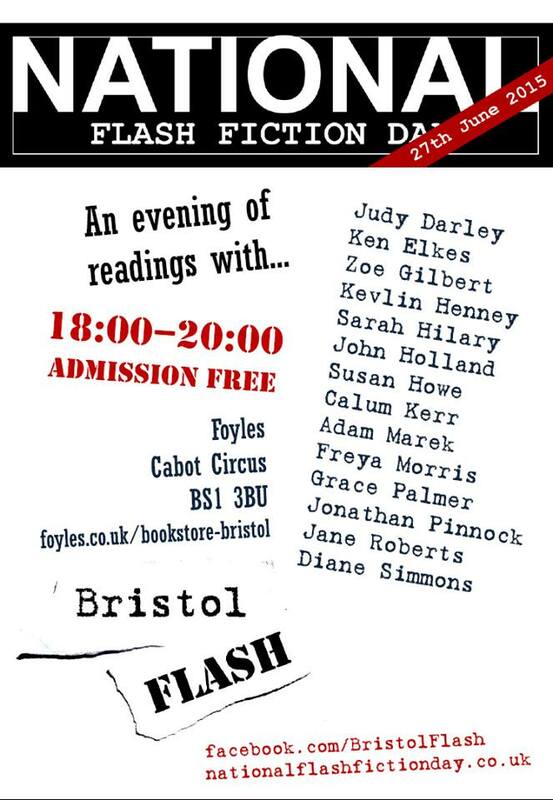 I’m looking forward to the official National Flash-Fiction Day event, which is at Foyles Bookstore in Bristol on Saturday 27th June. Entry is free! If you’re free make sure you come! Last year’s event was incredible and I’m really looking forward to hearing great flash fiction being read by these writers.